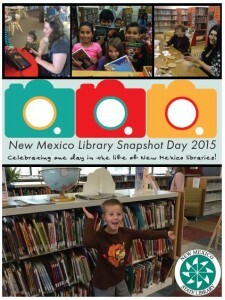 On (or around) April 16, 2015, 33 libraries across New Mexico joined in a celebration of “A Day in the Life of New Mexico Libraries” – aka Snapshot Day. Participating libraries tracked usage statistics, took photos, and collected patron comments to illustrate the incredible impact of library services each and every day. What resulted was further evidence of what library professionals know to be true – our library services are more important now than ever. I encourage you to review the New Mexico Library Snapshot Day 2015 Report below. Participating libraries will be using this document to advocate for libraries in their communities. I hope that in 2016 we will have even more libraries participate so that we can show an even greater impact.